Carson Street School student Tristan York (10) SwanCare activity officer Ceri Williams, residents Margaret Machin and Pam Mitchell and diversional therapy co-ordinator Annemarie Kluvers have fun at the Perth Zoo. 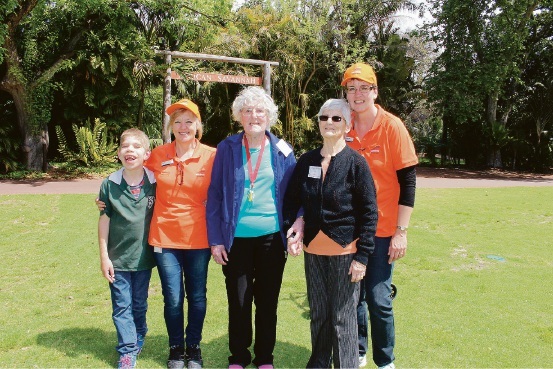 SENIORS at not-for-profit aged care organisation SwanCare in Bentley went on a trip down memory lane last Friday when they met with children from Carson Street School in East Victoria Park during a trip to Perth Zoo. The trip was made possible for the 31 seniors after SwanCare granted a day’s leave to a number of its administration staff who supported elderly residents with limited mobility. The group was also accompanied by six family members and three volunteer bus drivers. SwanCare chief executive Graham Francis said the organisation had put a great deal of time into planning the excursion with the residents, many of whom were well into their 90s. “It’s been many years since some of our residents went on a visit to the zoo, more than 40 years in some instances, so this was a great experience for them,” he said. “Our administration staff were also looking forward to the day because they felt it was a great opportunity for them to spend some time with the residents.